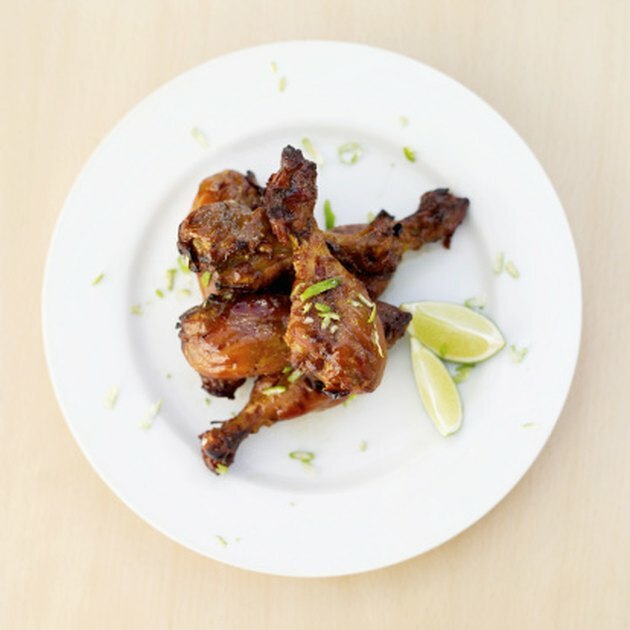 Chicken leg quarters are composed of the thigh and drumstick and are usually packaged with the skin still on. They are less expensive than pre-packaged, boneless, skinless cuts of chicken, but are just as easy to bake in an oven. It isn't difficult to remove the skin before cooking, which you should do to keep the fat content down. A 3 oz. serving of skinless, dark meat chicken contains 290 calories and 13 g of fat. The fat content is 20 percent of your daily recommended intake, so try not to add much more fat with your preparation. Breaded chicken baked in an oven offers a satisfying crunch without all the added fat of fried chicken. For the best flavor and results, marinate leg quarters for a few hours before breading. Roll the chicken in fresh, seasoned breadcrumbs and bake on a wire rack set over a baking pan. To keep carbohydrates low, you can just sprinkle the breadcrumbs over the top of the chicken. Make sure the internal temperature of the chicken reaches 165 degrees Fahrenheit for thorough and safe cooking. Test with a meat thermometer in the thickest part of the leg quarter, but don't let it touch the bone. A simple preparation is best when you're in a hurry or if you are cooking high-quality organic or farmers market chicken. Roasting in the oven with minimal ingredients lets the flavor of the chicken stand out. Any mixture of herbs and spices works on chicken. Tarragon and sage are traditional and particularly good. Rub the herbs into the chicken with salt, pepper and a little heart-healthy olive oil before roasting. You can also squeeze a little lemon juice over the chicken and rub with garlic, or try a Jamaican jerk rub. You can enjoy the tangy taste of barbecue chicken even if you don't have a grill or it's too cold to cook outside. Baking in the oven works just fine, although you won't have the full smoky flavor a grill gives. To compensate, use a barbecue sauce that incorporates liquid smoke. You can make your own sauce or purchase a bottled sauce. Bake the chicken first without sauce for 30 minutes, then smother with sauce and bake for another 30 minutes. Broil the chicken for the last few minutes to give it a little char. Oven braising allows flavors to really seep in and produces very tender chicken. Use a Dutch oven with a tight-fitting lid. Brown the chicken on the stovetop first, then add the braising liquid, cover and slide into the oven. Chicken broth and white wine with a little lemon juice work well as braising liquids. Flavor with herbs, onions and garlic. Don't be afraid of using too much garlic as the flavor mellows in the cooking process. Emeril Lagasse recommends 40 cloves of garlic for six leg quarters in a recipe for the Food Network. How Do I Marinate Chicken With Peri Peri Cooking Sauce?